In a post below, I discussed restacking the two stacks of books I have in the bedroom because the book after #5 was down toward the bottom of the right stack. Part of redoing the stacks was to take a critical look at all those books. 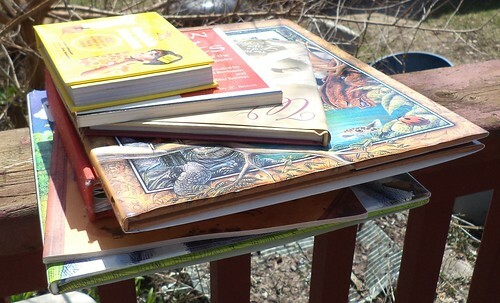 What I discovered was a small stack that I could read in 90 minutes and get them out of the big pile and either give them away or move them to another location to save. As Sunday was a wonderful day to be on the deck, I decided this was the perfect time to read. Let's see what we have here. I could have counted each book as separate and then patted myself on the back for having read my 12 books for 2014. But that felt like cheating, given that the longest read was 15 minutes. So I lumped them all together. Let's see what I have here. I'm not one for aphorisms. There are statements that I like and reflect things I believe. 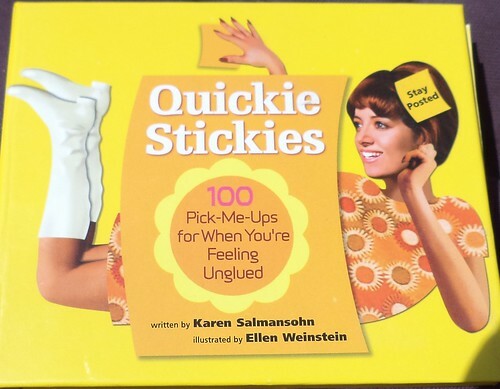 At one time, I thought I needed this book with its quick statements to remind me to be uplifting and remove negativity from my life. I have another book of Salmansohn that is meant to be given away. It's more funny than these are. Come to think of it, this might have been a gift from a "well-meaning" friend who is no longer a friend. I don't need or want aphorical stickies around my house. I have come to a place where I live life with gratitude, every day. Some of these were just weird to me. Maybe I have a friend who could benefit from these, but I don't know who. Rather than foist it on another, it's gone into the give away bag. For awhile, I was buying a new children's book every Christmas. I had the intention of creating a small library of literature if a grandchild ever came into my life. That's still a possibility and I have a nice size library if it happens. 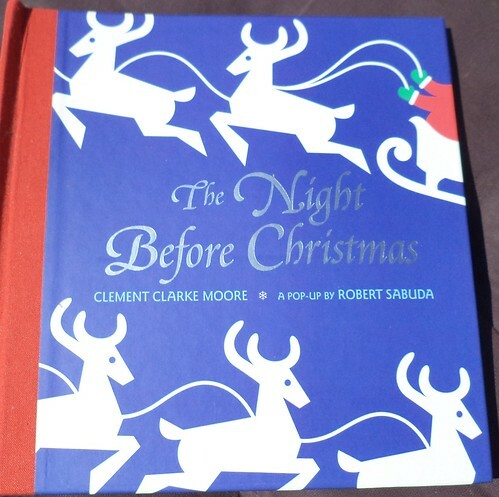 But when financial issues fell upon me, this turned out to be the last Christmas book I purchased. Raise your hand if you memorized this. I'd need a couple weeks but I'd remember it. 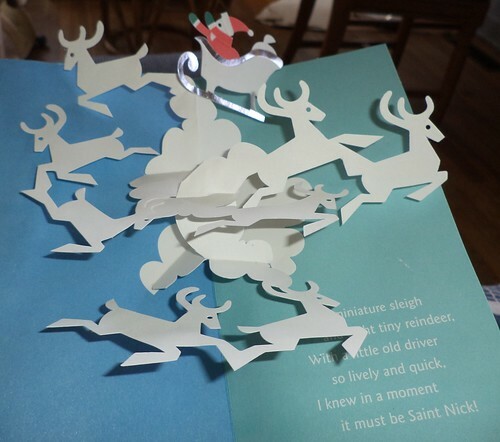 "...a miniature sleigh and eight tiny reindeer." Some of the pages were a bit stuck together because it's been in the stack for years. With a slight tug, they came apart and the pop-up sprang to life. This would be a fantastic book to share with family, but not something you'd hand to little ones who don't understand the concept of pop-up. Unlike other pop-ups, nothing moves. There are no levers or wheels to manipulate. It's all about opening the page and seeing a 3 dimensional representation of a part of the poem. I heartily recommend this if you can find it. This is an entry in the cat book library. If you have a pet, you know that you are drawn to books about that animal. That's what this falls into. I don't remember where I got it, but the only reason I would have it is because, oh wow!, it has a cat on the front and it's about a cat. 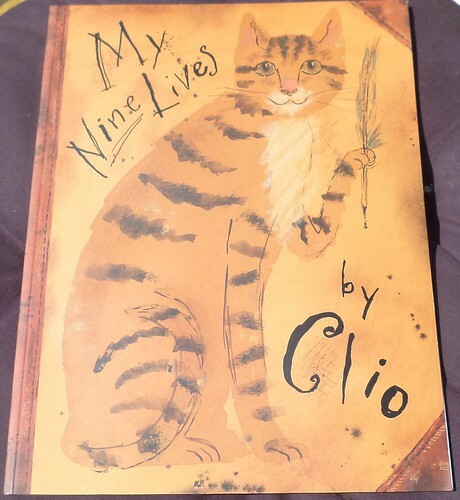 The premise is that the owner of Clio has discovered a journal written by Clio over the course of nine lives. It starts in ancient Egypt and goes through China and Europe before coming to the US. The cat talks about the way it changed the course of human history by, for instance, helping Leonardo Da Vinci paint the Mona Lisa. For a 1st grader with a good vocabulary and a desire to learn, this might be a good book, but I'm not sure who the target audience is. Plus, at the end, there is a discussion about each life and how some of the things Clio reports couldn't have happened. Um... Giving this away. Also in the give away bag is this book. Again, this falls in the "Oh look! 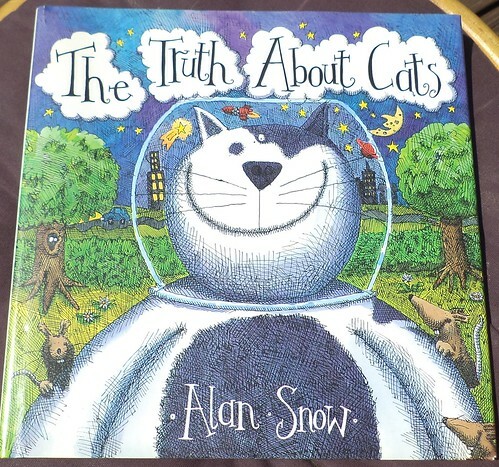 A cat book!" category. I know I picked this up for $3.00 at the Printer's Row Book Fair several years ago. At the time, I really didn't page through it. I simply bought it because it was a book about cats, hardcover and $3.00. Had I actually taken the time to look at it, I wouldn't have brought it home. The premise is that cats and dogs come from another planet. The animal you see is merely a robot, controlled by minute cats and dogs inside. The dogs, tired of being picked on on their home planet, left and found earth. Cats, now having no one to pick on, followed the dogs so they could continue to harass dogs. If ever there was a stupid premise, this is it. No, you can't have this book. I'm giving it away. I should find someone who will recycle it because it really shouldn't be in circulation. 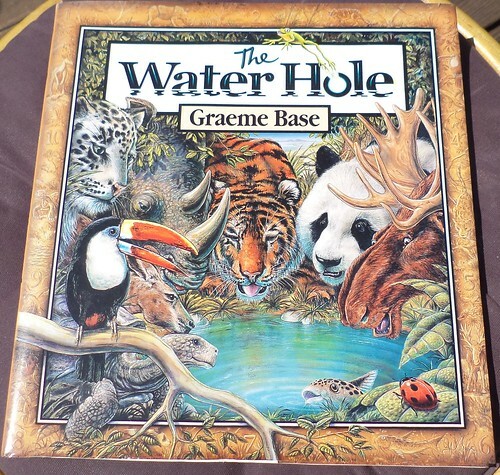 Graeam Base has always been one of our favorite authors/illustrators. He's Australian and his early works reflected life in that country. If you have never seen any of his works, find a copy of Animalia. It is the most amazingly illustrated book I think I have ever seen. There was a coloring book you could get for awhile as well as a boxed set that included the hardcover book, the coloring book and a set of 5 colored pencils. Get the book in hardcover. You will not regret it. Base often deals with environmental issues by showing what happens to animals when their environment is challenged or changed. That's what this is about. What happens if the water hole dries up. As with all his other books, the art is fantastic. You can lose yourself for hours just pouring over the illustrations. Think you've see it all? Nope, there's a bug over here, a pair of eyes over there, a baby under mom's legs. I got this when it first came out but never read it. I see on his web site that I'm way behind in my collection. I have 6 of his 15 books. Looks like I should add him to my list to search for at the book fair this June. I bought this but I don't know when. This is another book that had I taken the time to look through it, to read some of the pages, I wouldn't have purchased it. It's a series of quotes about women and cats interspersed with selected readings about this topic. 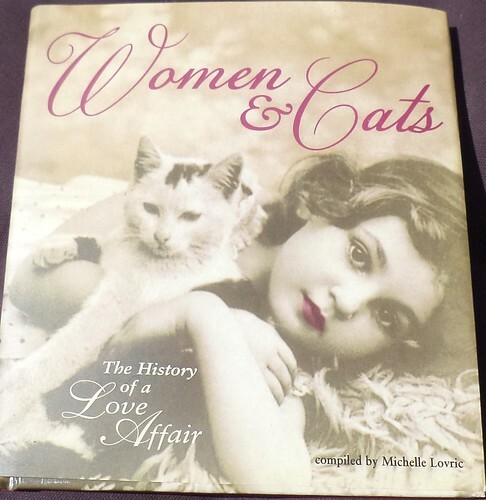 Too much of the book is spent comparing appearances and suggesting women would do well to follow the lead of their cats. Cats are always seen as aloof and women are likened to this. There are put-downs galore and the book ends with quotes about how cats are a witch's familiar and the shape witches prefer to change into and then roam the neighborhood. It wasn't a pleasant book. The only thing I got out of it was a list of names for future cats; Tewhit, Jarmara, Jeso, Prickear, Peyewacket and Griezl Greedigut. Why these names? Well, any cat given one of these was definitely a witch's familiar. Into the bag it goes. This is a small book that falls into the "Oh! Cat book!" vein. No clue where I picked it up or if it was a gift. I was prepared to go "meh" about it, but I found that I actually liked it. I like the ink drawings. They are fluid and peaceful. Cats and Eastern religions have long gone together. 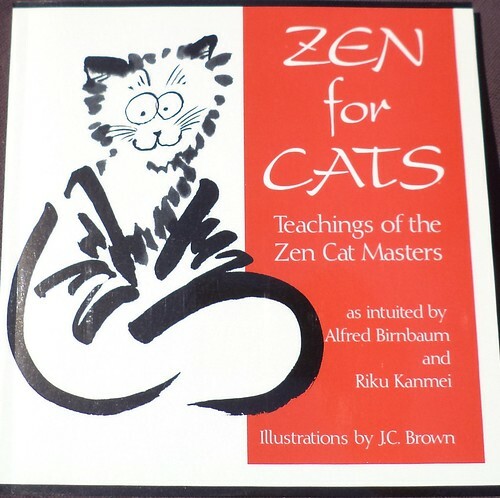 The cat exhibits the stillness and the ability to be "in the moment", so to speak, that Zen teaches. Some of the quips about cats are true. "One coat of fur sheds everywhere." "Find where the paths cross--sit smack center." "Door open--stay in. Door closed--go out." One statement I found particularly interesting. "If I have but nine lives to live, let me live them as a cat." That would be with awareness and calm, unless there's a thunderstorm, in which case, go hide under the bed. I'm hanging on to this book. So, there you have my Sunday reading. Four are being given away and three are staying. My stacks are smaller. Book #7 is on the ottoman in the living room and, based on the first 8 pages, I'm going to enjoy it.